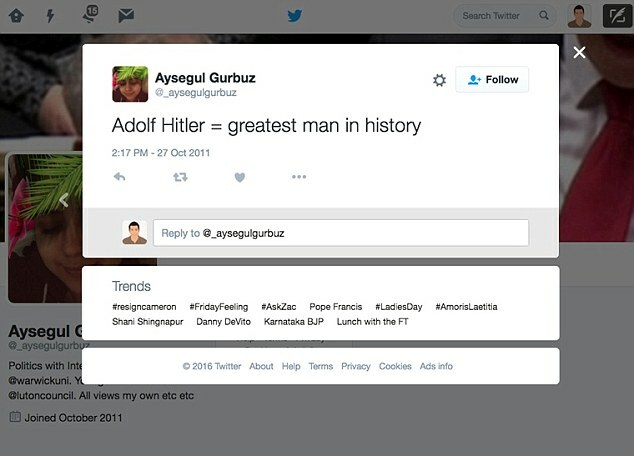 A number of Anti-Semitic tweets were posted on Aysegul Gurbuz’s profile between 2011 and 2014. One of the tweets from her account in 2013 said ‘the Jews are so powerful in the US it’s disgusting’. Vile posts were found by the Campaign Against Anti-Semitism. Luton councillor denied tweets and said her sister may have posted them. A labour councillor has been suspended for shockingly offensive anti-Semitic tweets, The Mail on Sunday can reveal. 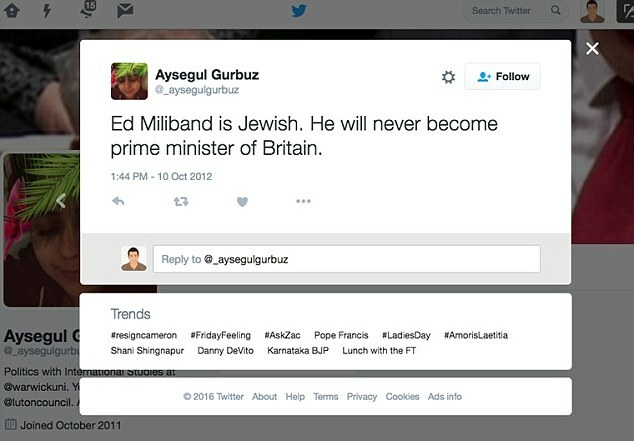 The discovery of Aysegul Gurbuz’s vile comments is the latest in a series of anti-Semitic scandals to hit the Labour Party. 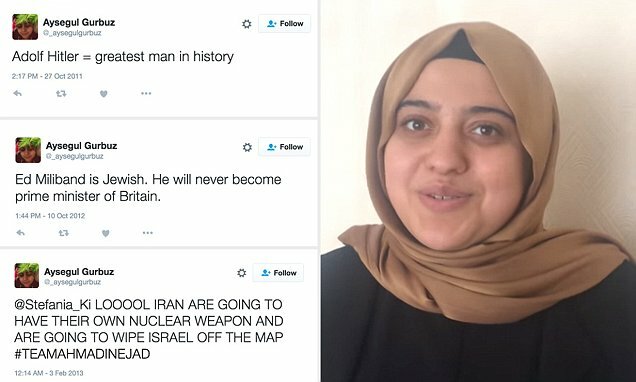 The 20-year-old student is alleged to have called Adolf Hitler the ‘greatest man in history’ and said she hoped Iran would use a nuclear weapon to ‘wipe Israel off the map’. Miss Gurbuz, who is Muslim, became Luton’s youngest councillor when she was elected to the High Town ward last year. But last night Miss Gurbuz was suspended after the Campaign Against Anti-Semitism found a series of disturbing posts on her Twitter account from 2011 to 2014. Another post, in October 2012, said: ‘Ed Miliband is Jewish. He will never become prime minister of Britain.’ And Adolf Hitler was praised as the ‘greatest man in history’ in a tweet in October 2011. 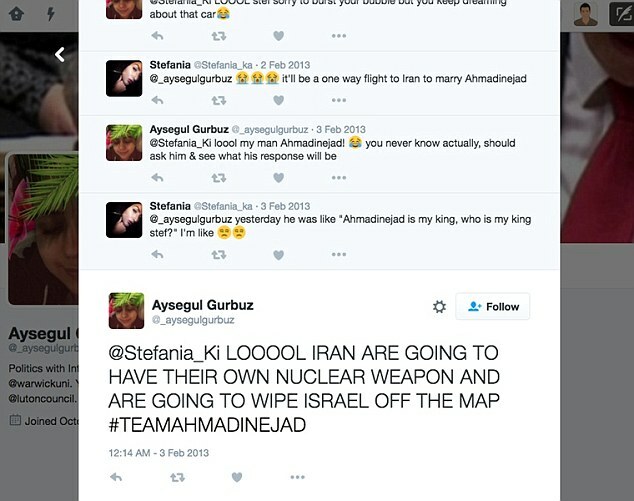 Miss Gurbuz last night denied she had written the tweets and claimed her sister may have posted them. The suspension is the latest anti-Semitism probe within Labour ranks. Labour peer Baroness Royall is already leading an inquiry after Oxford University Labour Club’s co-chairman resigned, claiming a ‘large proportion’ of its members had ‘some kind of problem with Jews’. Louise Ellman, one of Labour’s most senior Jewish MPs, claimed last week there had not been enough done to tackle the party’s anti-Semitism problem. Labour’s London mayoral candidate, Sadiq Khan, said anti-Semitism was a ‘badge of shame’ in a speech on Wednesday and urged Mr Corbyn to act. The Labour leader responded that he would immediately investigate ‘any form of anti-Semitism’ and it would be ‘cracked down upon’. Miss Gurbuz is in her final year at Warwick University, where she is also events organiser for the student union’s Friends of Palestine society. She told the Campaign Against Anti-Semitism: ‘It was a joint account I had with my sister so I don’t know if she’s gone out and tweeted that, but I’m absolutely appalled right now. Miss Gurbuz did not respond to our calls for comment last night. Jonathan Sacerdoti, from the Campaign Against Anti-Semitism, said: ‘These tweets are anti-Semitic. They appear on Aysegul Gurbuz’s personal account and there is no defence for that. Trevor Holden, chief executive of Luton Borough Council, said: ‘This will be referred as a matter of urgency to the council’s independent standards committee to allow a full investigation to take place. Sadiq Aman Khan is a British politician who has been the Member of Parliament for Tooting since 2005. A member of the Labour Party, he is standing as the party’s candidate to be Mayor of London in the 2016 mayoral election. NATO ‘Ally’? : Turkey continues to send arms, ammunition and jihadists to ISIS.